Harley-Davidson professionals run tight ships. You already know how to make money. You want customers to get a good impression at your store. You want a dime back for every nickel invested. You appreciate good ideas. Here is a great way to elevate the retail experience, enhance the inventory on the floor and make money. Using the resources, you already have (employees and accessories) with the addition of an old-school pinstripe artist, you can transform a plain motorcycle into a CVO. By adding custom exhaust, handlebars, hand grips and other accessories along with thin, delicate pinline designs, the bike stands out wherever it goes. The custom additions add value to the bike and provide wiggle room for the salesmen. Plus, your name goes on the bike to expand potentiality in the mind of the customer. The custom bike attracts attention on the floor, enhances the retail experience of your guests and commands more money. Custom bikes with pinstriping are not new. This benchmark of quality existed long before motorcycles; in the carriage making industry. Craftsmen took pride in their proficiency. To establish their product as superior, accurate pinstriping made their output stand-apart from the rest. Hand-painted accent striping followed vehicle manufacturing into the gasoline era and onto all the manufacturing assembly lines. Like playing the piano, the ability for an artist to create thin, accurate lines with paint occurs over decades of providing this service to motorcycle, hot rod and automobile owners. 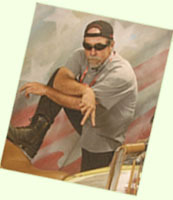 Letterfly has been painting and striping in the traditional manner since the early seventies. Letterfly provides this pinstriping service on site. Letterfly enjoys a route of customer-dedicated Harley-Davidson stores nationwide. The artist will be happy to come to your store to make your inventory visually appealing, add this time-honored element to the retail experience and increase your bottom line. Plus, there are other creative services to take advantage of while the artist is at your store. Interior murals create a unique environment and custom sign work helps establish your brand. Read on to find out about other services Letterfly can provide. Call 813 752 8063 or email Letterflyartiste@aol.com to schedule having the artist come to your store. While at your store the artist can become a speaker to enhance the experience of your guests during Garage Night, HOG chapter meetings and special events. There are other value-added services the guests can enjoy. 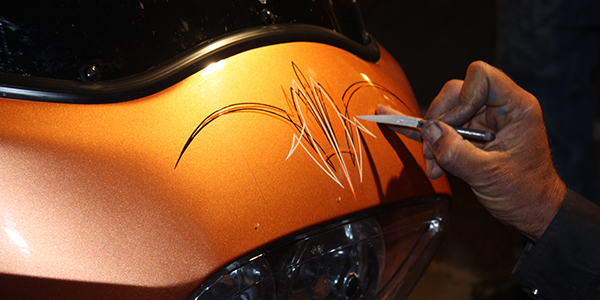 Having the Gallery/ Pinstriping booth set up in the parking lot elevates interest in the custom offerings of the artist and gives your guests an opportunity to indulge in pride in ownership and commission some custom paint of their own to set their bike apart from the rest. But that’s not all. Famous for the pinstriping and mural design services provided to Harley-Davidson stores nationwide, Letterfly has found more ways to generate traffic to customer dedicated motorcycle destinations. These value-added services to the biker community are a proven hit everywhere along his annual tour. To assist with generating excitement, additional activities are also available including; a multi-media ad campaign for your email blasts, an informative Seminar, an Art Show, shirt and poster designs for your HOG chapter to use, valuable gift certificates to promote attendance at events and dealership apparel logo design development to assist RKStratman & Co. Browse through the other pages of this website to find additional ways Letterfly can Cre8Traffic for your store. Now with plenty of reasons for your staff and guests to enjoy a variety of experiences and expanded services while at your store, here is the information on how to plan on having Letterfly in your future. This site is designed to provide easy to use information about the spectrum of creative features that heighten the experience for both the dealership and motorcycle enthusiasts. If your goal is to attract patrons that have never been through your door, utilizing these enticements will stimulate interest in the community prior to the arrival of the artist. Let’s face it, everything that Letterfly creates qualifies as entertainment. Entertainment adds to the retail experience and is perfect to include in your marketing. Letterfly looks forward to enhancing the offerings at your store and co-creating with you the perfect experience to establish your store as number one in the minds of your guests. Click on the button to view a sample of our multi-media email offerings. To return to this page, hit your browser's back arrow. Booking and Logistics (Home Office) 813 752 8063 Letterflyartiste@aol.com Kelly runs the Home Office, wears many hats, and with a background in disaster management, brings to the team the proactive skills necessary to keep the road team out of trouble (mostly). Marketing IT and Customer Relations (cell) 229 395 9967 onerudyburger@yahoo.com with a background in cinematography as a SteadiCam operator and as a roadie with touring rock shows. 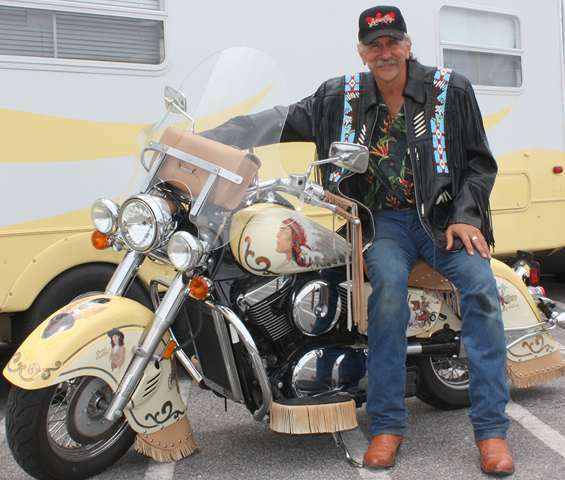 Mike is the primary voice on location with Letterfly and is a source of inspiration to the bikers that seek personal expression on their motorcycles. 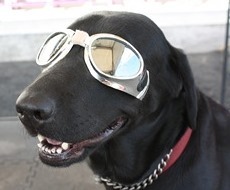 Greeter, with four years experience as a Black Labrador Retriever, Mimi brings comfort, compassion and understanding to the bikers while they wait for their scoot to get duded up. Her repertoire includes rollover, sit up, fetch and her ever popular "Inside Bark". “The smartest thing I ever did was join the circus!” This decision launched a teenager into a prolific, itinerate career. The musician/artist Dave “Letterfly” Knoderer found expression as a show drummer accenting the efforts of the aerialists, performers and artistes, elevating the experience of the patrons in a fast-paced, uniquely American lifestyle as well as plying skills with a brush to decorate the fleet with his emerging style. Being part of this distinct entertainment experience provided skills that morphed into the relentless venture of creativity that continues to this day. While drumming under the big top lead to a fascination with animal training, soon Dave was performing with horses, starting with multiple animal liberty presentations and then graduating to classic horsemanship with a specific interest in the discipline of “Haute E’cole.” As levels of finesse were accomplished with his equine dance partners, parallel interesting developments showed up in the pinstriping, airbrushing and graphic work that financed this quest. As the evolution of entertainment grew to exclude horses, the demand for his unique style of artwork expanded and travel to serve a growing list of clients remained one of the constants in his lifestyle. Today “Have brush will travel” serves customer oriented Harley-Davidson stores, works on various mural and high quality paint projects and attends bike events to create quality art on motorcycles and other modes of moving fast. Traditional brush painted pinstripe designs, pin-up girls, pictorials, inscriptions, pets, portraits and custom images of all kinds are produced on the spot, in various locations, all across the nation. Letterfly clearly qualifies as an old school/renaissance man. Apprenticing the sign painting trade, he learned design layout formulas and became intimate with letterforms, pinstriping and wet-blended pictorial painting as his skills with the brush developed. With a penchant for adventure, the young artist soon became involved with painting theatrical sets, amusement park and fairground décor, antique fire engine gilding and restoration, along with creating conventional, hand lettered signage and award winning storefront décor. As sign making began to go the way of the computer three decades ago, letterfly found a niche airbrushing high quality murals on the backs of motor homes. One such project, an eagle flying over a scenic view of the Rocky Mountains was for a Harley-Davidson store owner who soon after, also commissioned murals inside and out at his motorcycle dealership. The episode lead to other similar projects. While in the proximity of bikers it became impossible for Dave to avoid the relentless requests for delicate pinline designs that personalize, individualize and distinguish their bike from the rest. Perhaps the most amazing feature of this artist is the uncanny ability to visualize, develop and create images that have never been done before, along with the wide variety of styles of pinline designs, his oneness with eagles, wolves, horses, feathers, flames and countless other icons that make up the mainstay of his work. During the winter months, extensive paint jobs on an endless variety of interesting things takes place at his home/studio/paint shop called ArtPark, in Florida. When it’s cold up north, motorcycle enthusiasts dismantle their bikes and ship the pieces to Letterfly for intricate design work, over all custom repaints and spectacular paint jobs that showcase his vast repertoire. When RVers head to Florida during the winter, they visit ArtPark to get a custom designed airbrushed mural on the back of their motor home, a portrait of their pet on the entry door, some graphic shapes on their tow-car that resemble the design on the coach, a monogram, special inscription or any number of one-of-a-kind images that the artist conjures up just for them. Lush garden pathways connect the shop, studio, RV parking and gallery situated in a quiet oak hammock that is a haven for creativity and a destination for RVers and bikers alike. During the spring, summer and fall the artist is on location at customer dedicated Harley-Davidson stores, hot rod shows, bike events and working on various projects throughout the country. The route is posted on a blog; Travelog.Letterfly.com so you can find out when the artist is going to be near you. No matter what sort of wheeled machine you have; touring bike, motor home, automobile, hot rod, motorcycle or even a guitar, fanciful artwork, colorful swoops, hand lettered inscriptions, a full fledged mural or a mini portrait, gold leaf gilding and the old school hand painted pinstriping that he is famous for, the finishing touch will personalize your rig and make “looking good” a reality and traveling down the road more fun. Copyright 2011 Letterfly, Inc. All rights reserved.